The procedure to replace SSL certificates has changed in recently released VMware View 5.1 and differs from 5.0 or earlier versions. The main difference is that native Windows certificate store is used. Also it is now necessary to replace or at least to verify self signed certificates otherwise the View infrastructure will not work properly. Which servers need to replace the certificates? View Connection Managers, Security servers and View Composer. 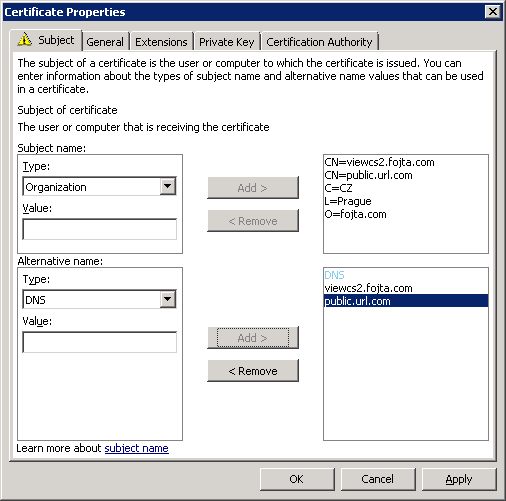 Also vCenter certificate must be replaced or validated. Although the certificate replacement procedure is described in the manual, the description is very brief and it took me some time to figure it out. I also found an existing blog post which takes different angle here: http://my-virt.alfadir.net/2012/05/generate-view-5-1-certificat/. My lab configuration is following. View Composer is installed together with vCenter. I have two View Connection Managers; one for internal connections and one for external internet connections. I do not use Security server as I use port forwarding to the external View Connection Manager. All servers are in the domain with Enterprise CA which uses self signed certificate. 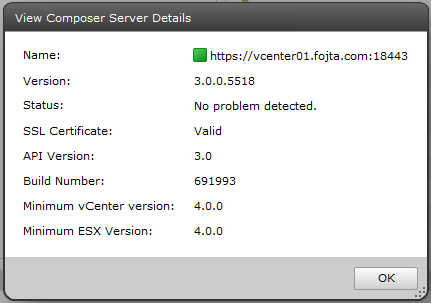 My View Composer server is coexisting with vCenter so I did not need to generate new certificate. I just imported the vCenter certificate from C:\ProgramData\VMware\VMware VirtualCenter\SSL into the local Windows certificate (Personal) store via MMC Certificates Snap-in. Select the .pfx file which contains both private key and the certificate. and select the new certificate. 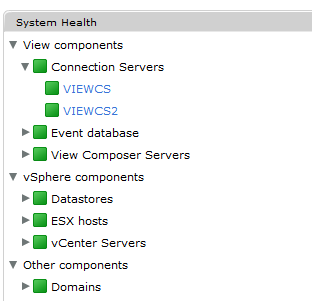 Start the View Composer process again and check the status in the View Administrator. Here we have to generate the certificates. To do this I am again using the Certificates Snap-in. However prior to that I needed to give both of my Connection Server access to Web Server certificate template. On my CA open the Certificate Templates Management Console Snap-in and open properties of Web Server certificate template. 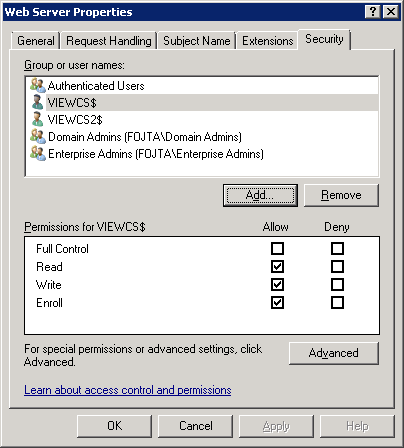 Open the security tab and add both View Connection computers and give them read, write and enroll permissions. Now we can go to each Connection Server Certificates Snap-in and right click, select All Tasks and Request New Certificate. 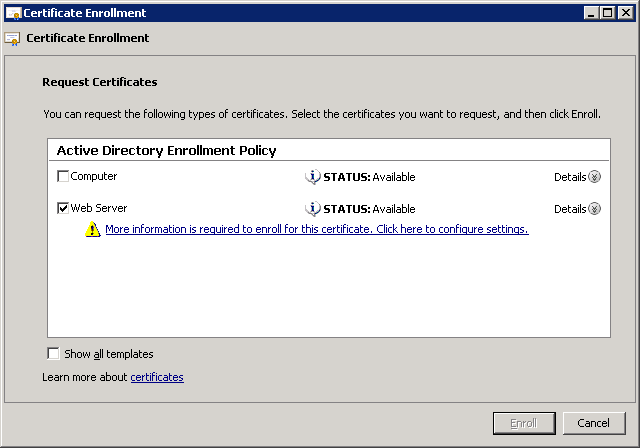 Select Active Directory Enrollment Policy and Web Server certificate template. Now we have to add FQDN and additional info to the certificate. Click the More information is required … link. And do not forget to make private key exportable in the Private Key tab / Key options. Once this is done we can restart the View services. 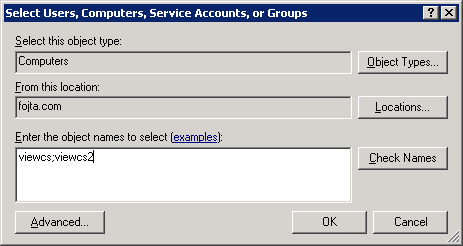 Repeat for all other View Connection servers and check the result in the View Administrator. As I said at the beginning my CA uses self signed certificate so I have to make sure all the non-domain PCs I use to connect to my View desktops imported the CA Root certificate into the Trusted Root Certification Authorities store. Thanks mate ! You save me from a big headache ! Fine, but when I go to import the pfx file for the Composer it asks for a password. Where did this password come from, I’ve ried the obvious ones and nothing works. 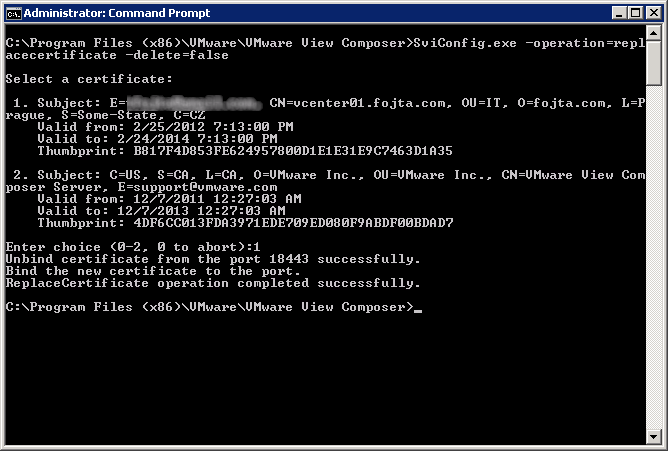 This is the rui.pfx that was generated automagically as part of the vCenter/Composer install, I presume? And… stupid question – are you importing the Composer certificate into the View server or the Compser/vCenter server’s personal store? if you are using the default self signed certificate from the Composer setup, you must also use the “default password” from vmware. It is: “testpassword”. If you are changing the certs, then you have set a “secret” at the creation of the Certificate Request File (CSR). Sometimes, this password is “blank” (no letters). A second way to solve the Composer Cert problem: Verify and acknowledge the self signed certificate in the View Administrator. After that is appears as “trusted”. You do not need to import the Composer Cert into the personal store of any other server. You should only import all needed Root CAs. Also the Intermediate CA, if you have one.